Whether you see it coming from a mile away, or it comes as a complete shock, losing your job in a layoff can rock your world. To help you find a job after being laid off, we created a step-by-step list of 7 things to do the first week after being laid off. Follow the simple steps and you’ll be organized, calmer, and on the path towards finding a new job, even if you still feel like you don’t know which end is up. Let’s get started. Layoffs, as we’ve mentioned, are often unexpected and can leave you feeling vulnerable. Immediately after it happens, do something kind for yourself. Call a friend and grab a drink or two (or three). Get a massage. Take a hike in a beautiful place. Make an appointment with your therapist. Losing your job can feel like rejection, and it’s important to process the emotions associated with that loss. Let yourself feel all your feelings; they are valid and taking at least a day to process them will give you the strength to take the next steps. Unfortunately, there is a lot of paperwork associated with a layoff. First things first: get your unemployment paperwork and your health insurance paperwork filled out and squared away. You’ll feel better immediately without these administrative tasks hanging over your head. The health insurance piece will look different depending on your situation. Depending on your severance package, some employers might extend your health coverage for a period, while others will offer you COBRA. Some people might choose to explore other options. However you decide to handle it, sorting out health coverage right away is important. After all, you never know when you are going to need it. Your employer should provide you with information about how to apply for unemployment in your state if you qualify. Even if you’ve received a severance package, it’s a good idea to get this piece of the puzzle figured out right away since it can often take several weeks for unemployment checks to begin rolling in. Whether you hope to jump back into the same role as before, or if you plan to make a career change, every job search requires a resume refresh. After a layoff, spend a day creating an updated resume that reflects the skills and experience you gleaned in your most recent role. If you don’t know where to start, consider putting a resume builder to use. Wherever possible, include data and numbers to show off your accomplishments. This step is never more important that after a layoff, when you are eager to prove your value to a new employer. There are many ways to quantify your achievements on a resume, regardless of your field or job title. Do some research to uncover the best way to articulate achievements in your field. While many job seekers erroneously believe that employers don’t read cover letters, they are a powerful tool in any job seeker’s tool box. When faced with candidates who possess similar qualifications, recruiters and hiring managers often turn to cover letters to help them decide which candidate to interview. For that reason, a well-written cover letter can be the tiebreaker between two similarly qualified candidates. Take the time on Day 4 to write a fresh cover letter that highlights and expands upon the skills and experience in your resume. A cover letter shouldn’t rehash your resume; it should illuminate those resume qualifications and paint a picture of who you are as a person and as a candidate. For those who have recently been laid off, a cover letter is also a chance to offer an explanation of why you are no longer in your most recent role. No long account of the layoff is required. Rather, just a line or two will suffice. This is one of the most important things to do after getting laid off. Even though you may feel a sense of embarrassment about losing your job, the truth is that layoffs are a fact of life. These things happen and it doesn’t necessarily reflect what kind of employee you were. Once you’ve had a few days to process and take care of the administrative tasks, start reaching out to your contacts and networking to let them know you are looking for work. Spreading the word in your professional circles is a great way to start the ball rolling on a job search. Some studies indicate that up to 85 percent of all jobs are filled through networking. Regardless of the reason for your layoff, during the networking and interview process, you are going to have to explain to contacts, colleagues, and recruiters why you are back on the job market. 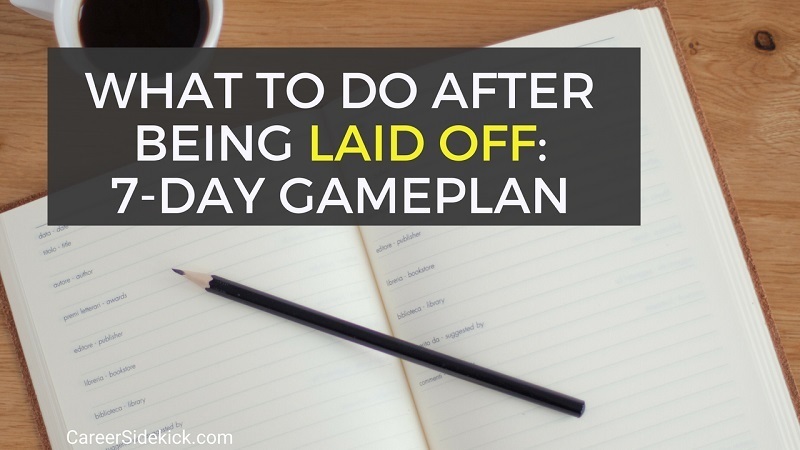 Take the time to decide how you plan to articulate your layoff. Write a short, simple explanation of why you lost your job (“Thanks to budget cuts, ten percent of the company lost their jobs. Unfortunately, I was one of them.”) and what you hope to do next. Keep it brief and positive. Never share negative details about your former employer. It’s often hard to relax and enjoy yourself during a layoff. Money might be tight, or the stress of the job search could be weighing on you. However, it’s wise to do your best to enjoy this time away from the daily grind. If you have the money to travel, do it now. Take advantage of this break to get back in shape. Or, use your free time to take an online course to learn a new skill! Remember, staying positive and productive during a layoff is critical to performing well in job interviews. You will get a new job; in fact, most job seekers find a new role within six weeks of launching a job search. Follow these tips for how to find a job after being laid off, and you’ll have the best chance of getting hired quickly while staying sane in the process.